How Can Your Family Dog Teach Your Children Empathy? This is a concept we all want our children to learn. Preferably before they become known as the mean kid at playschool. Nagging your child whenever he has something - but wants to keep it to himself - is not the way we want to interact with our family. Being told to share can push a reluctant sharer the wrong way and increase his feelings that his possessions are being threatened. So, to dodge this particular minefield, how about bringing in a helper who will teach your child the joy of sharing without any pressure - or even parental input? There she is, waiting in the wings, always happy to oblige with a bit of company. You have doubtless put plenty of effort into ensuring that child and dog got off to a good start - starting early in pregnancy acclimatising your dog to baby gear, sounds, smells (see Resources below for help with this). Exposure to each other should be limited and always actively supervised. The child should never be allowed to badger the dog, and - of course - you never leave any child alone with any dog, not even for a moment, not even while you answer the phone. Always take one of them with you. You’ll need to teach the dog a default Leave it - check out the step-by-step book here - so that boundaries (toys, food, beds) are clear and there's no confusion. And your baby will need to learn the same trick! It’s part of learning respect for others and their space and things. Oh, and no cutesy pictures of the baby crawling on or hugging the dog please! A little study of Dog Body Language will show you how close many of these babes you see on the internet are to a bite. So, having carefully worked through all that, the pay-off is that your small child should already have a firm relationship with your dog, enjoying the fun she brings to play, and the comfort of a soft, fluffy friend to commune with when in need of company or reassurance. 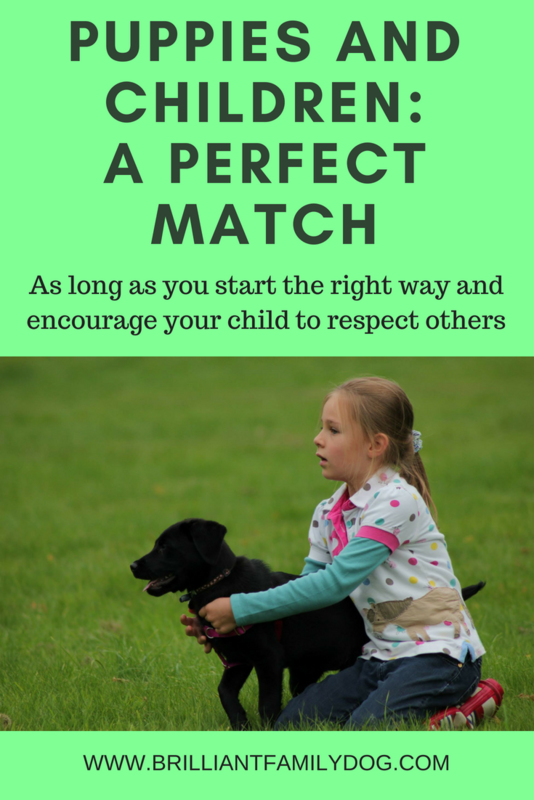 You can encourage your child to include the dog in his plans. You can encourage him to think of her needs. “What’s Maisie having for dinner?” Your child can help prepare her something he knows she likes, and learn to see to her needs before he gets his own supper. “Where’s Maisie going to sit?” you may ask when being shown a splendid “treehouse” in the hedge. This is probably just a muddy hole with some branches over it - but it’s an important construction! And there may well be a place for your dog built in to the plan already. “Shall we bring Maisie?” You can discuss how Maisie may feel about the proposed outing, and whether she’d be happier coming or staying at home. “Do you think Maisie would like to be left alone to sleep now?” Oh how important this one is! Maisie has a right to her own privacy, and will need to sleep at least as much as your baby does. You can juggle the waking and sleeping times so that there are only very few times when both are active and need that constant supervision from you. An under-rested dog is just the same as a fractious overtired toddler - she can’t cope when she needs to be asleep and is being poked and prodded. Don’t test your dog’s patience! Sharing his treehouse, his games, his excitement, his sadness - and sometimes the food he doesn’t want to eat, secretly dropped into Maisie’s waiting mouth below the table - will give your small child a way to express himself and his feelings without the complications of human interactions or sibling competition. If he doesn’t want to feature the dog in one of his games or imaginings right now, then she’ll be happy to doze in her bed till she’s needed. No offence taken. He will learn the pleasure of sharing in a simple, natural way - without us having to keep telling him. Putting the dog’s needs first, helping her with the things she can’t do herself, and appreciating the things she can do so much better than he can - having her find lost shoes, for instance - will teach your child empathy faster than any other way I know. The Darlings in Peter Pan had Nana. You have your own nursemaid. Put her to work for you!